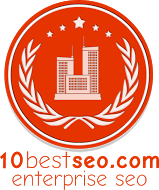 10 Best SEO is pleased to announce a new award category: Best Enterprise SEO Agency. The agencies that have won this award excel in providing clients with exceptional, customized search engine optimization services. Recently, 10 Best SEO announced a new monthly award for the Best Enterprise SEO Agency. The rapidly-growing awards organization chose Digital Current as its best enterprise SEO agency for May 2016, along with two other worthy contenders. This kind of SEO is intended for enterprise level entities such as corporations or very large organizations. These national and sometimes international organizations require different and often higher-level services than a small business, which might require only local SEO services. Corporate-level SEO is a major challenge and only a handful of companies can truly perform in this highly competitive arena, and that's why 10 Best SEO sought out the best for its awards. Digital Current, located in Mesa, Arizona, is worthy of heading this month’s list of best enterprise SEO agencies. This corporate SEO firm provides its prospective clients with a lot of details and transparency about their service, how they operate, and how they manage to get such great results. The future of a lot of businesses relies on their continued online presence remaining strong and in the spotlight, and Digital Current can help keep those rankings high. This company is staffed by long-time search marketing professionals who know the current trends and how to best manipulate the rankings to a corporate entity's advantage. Boostability, a leading enterprise search engine optimization firm based in Lehi, Utah, also made the list. This firm specializes in enterprise level SEO, meaning that instead of catering only to small businesses who might require only SEO for their local search rankings, Boostability can help multinational organizations increase (or "boost") their search engine rankings on a global scale. Boostability has made sure to employ only the most well qualified individuals for their company, and the benefits of having done so are clearly obvious to their client base. Top enterprise SEO agency WebpageFX ranks third on the list of winners. It specializes in providing large entities with corporate-level SEO services. WebpageFX is based out of Philadelphia and is fully staffed by digital marketing experts who know how to get a major entity's website ranking for the keywords and key phrases that matter the most to their bottom line. With affordable rates and a friendly staff of professionals, WebpageFX easily took a spot on 10 Best SEO's rankings of the best enterprise SEO agencies. For more details about the award winners, please visit http://www.10bestseo.com.